I am so frustrated that my website has been having difficulties the last few days. Thank you for your patience! To reiterate what I’ve been saying on social media, the site is not down, but just reeeallllly slow. Keep trying to refresh the page you want and it will load eventually. I am doing my best to get the issue resolved. In the meantime, let’s have some fruit crisp! 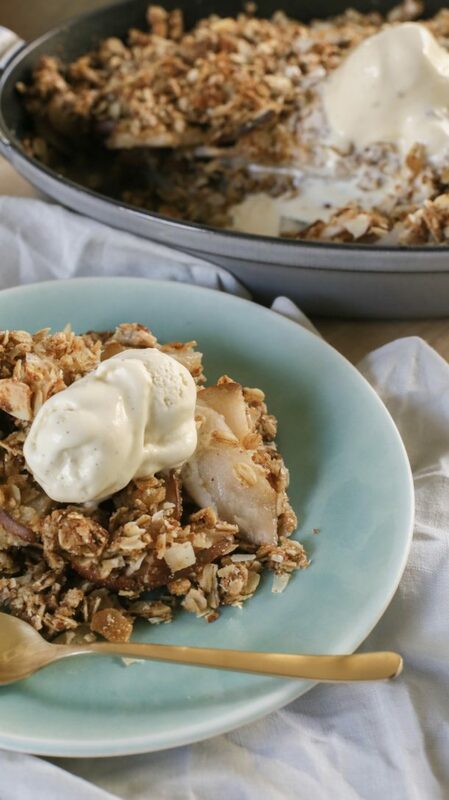 Do you need another fruit crisp recipe? As far as I can tell, crisp is not a dessert people tire of. 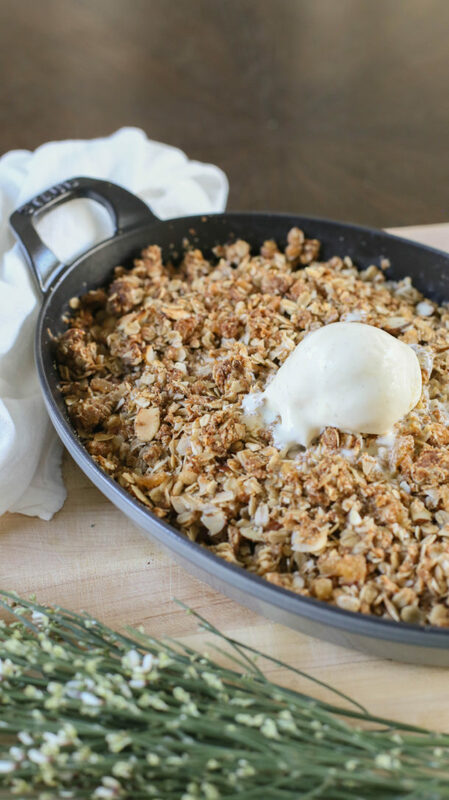 What isn’t to love about warm and juicy seasonal fruit buried underneath a sweet and crumbly topping? I know I always say that desserts are not a food group with which you should be hanging out a lot, but who can live a life without them entirely? Not me! 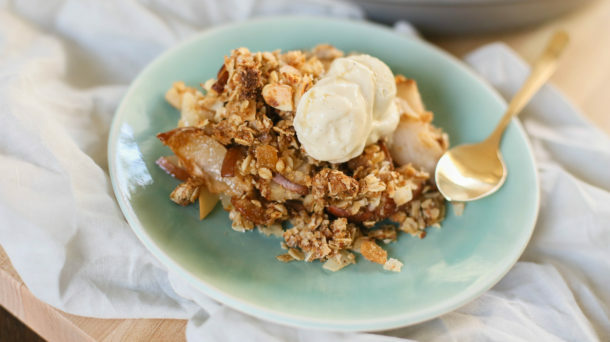 Although I love a classic fruit crisp, this one is a little different. 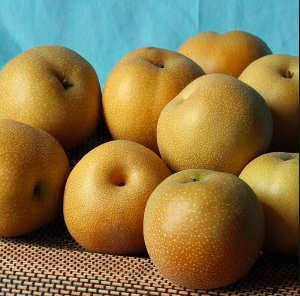 First, I am using Asian pears, which is not a classic fruit in desserts. In my opinion, the taste is like a cross between a sweet apple and a pear with the crunchiness of a juicy apple. The flavor is very delicate, and lightly sweet. I also love Asian pears in salads. They are delicious and only in season around this time of year. 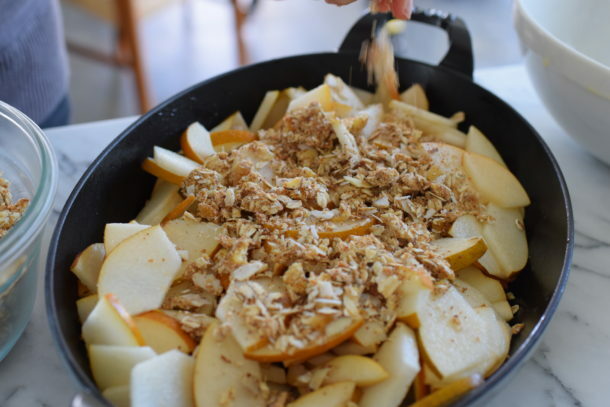 If you can’t find Asian pears where you are, any seasonal fruit will do because this topping goes with everything. The topping is what makes this crisp slightly different from the norm. It still has a base of rolled oats, but I have included some coconut flakes and candied ginger, as well. I am crazy for ginger in any form. It just adds a nice zing to this dessert. You can find crystallized/candied ginger at Whole Foods and Trader Joe’s. In addition, this crisp topping uses no grain flour at all, but instead incorporates almond flour. Overall, this is not a high-sugar dessert and that is what I keep talking about in my classes. Let’s not just use minimally processed sweeteners, but let’s also use less of them. That is how you create a lower glycemic dessert. Try to train your palate to be accustomed to less sugar, even if it’s maple syrup. It can be done pretty quickly! Another reason I love making crisps for entertaining is that you can make the topping months in advance and freeze it. Or you can make it several days ahead and refrigerate it. 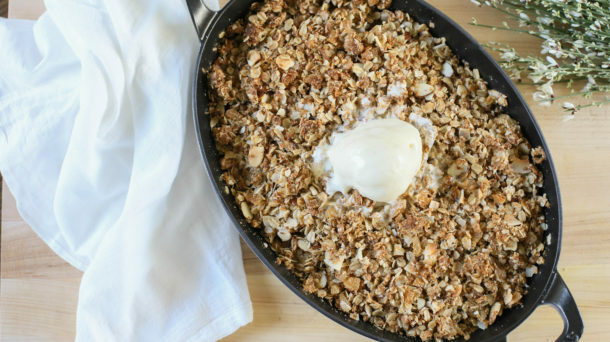 I usually bake a fruit crisp at least several hours in advance so the juices can settle and thicken a bit. If you are lucky enough to have leftovers, how good is a crisp the next day for breakfast with some yogurt?? I approve! 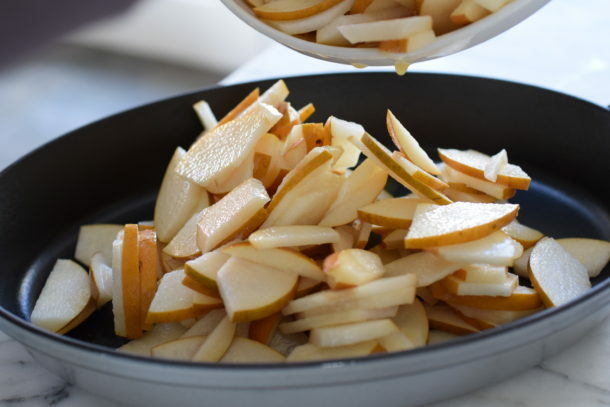 Toss the pears with orange juice, maple syrup and arrowroot (or flour) and transfer to an 8x8 baking dish. In a bowl of a mixer pitted with the paddle attachment, combine all of the topping ingredients and blend until the mixture resembles small peas. This can also be done by hand with a pastry blender. Squeeze with your hands to create small clumps. Arrange topping over fruit to cover. Place baking dish on a cookie sheet and bake for 50-60 minutes or until bubbly and topping is golden brown. Serve warm or at room temperature with vanilla ice cream, if you like. To make crisp in a 13 x 9 –inch baking dish, double all ingredients and bake for at least 1 hour. If the topping starts to get too dark before the fruit softens, cover loosely with a piece of foil. This was delish! Relatively easy to make and great dessert to serve when having people over.